I will be writing plenty over there, as part of an overall series of duties that involves managing and producing content for the Dodgers’ publications and website. As you can imagine, it’s an opportunity that was too intriguing and exciting for me to pass up, which is why I’m willing to give up the longest job I’ve ever held, a position at Variety that has brought me more great memories than I can begin to mention and placed me among a group of colleagues that have been such a pleasure to be with. It’s also why I’m willing to put Dodger Thoughts in storage – though again, this isn’t exactly as newsworthy as it might have been, before I essentially took a vacation during the 2012-13 offseason, to focus on an extremely busy awards season for Variety. 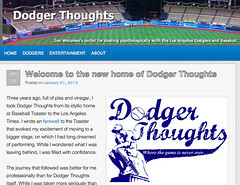 I did find a rebirth on Dodger Thoughts during the 2013 baseball season, but it was always in competition with the other directions I’ve been pulled in. So while it would be premature to get into specifics about my new duties with the Dodgers, I can say that one of the greatest appeals for me is that for the first time, writing about the Dodgers will move from avocation to vocation, from hobby to primary activity. Congrats to Jon! I know Variety's going to miss him and all the hard work he's done over there through the years. But I'm truly excited for him.